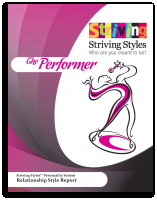 The Relationship Style Report helps you understand how your Style behaves in relationships, both when self-actualizing, and when being self-protective. This information helps you choose the behaviors that are most likely to move you toward desired outcomes, so you can consciously shift to self-actualizing behaviors, negotiate to get your needs met and stay connected to others! It also gives tips for the people you are in relationship with, so that they know how to respond to you, and how to ensure your predominant need is satisfied. Don't leave your happiness to chance. Read your relationship report and those of the people you are closest to.